Whilst people have been tinkering in their sheds attempting to create robots to serve all manner of purposes since the early seventies and eighties, it was in the 90s that amateur robotics really took off. The arrival of the TV show Robot Wars inspired hundreds of amateur engineers and electronics hobbyists to attempt to create their own all-conquering robotic powerhouse, and ever since then amateur robotics has been growing in a big way. One of the main attractions of amateur robotics is that it is not only GIVES incredible fun, but it’s also relatively simple to get involved in. There are now many companies offering components online (Proto-PIC: are one of the best), and once you’ve learned the basics of robot building it’s easy to get your hands on pretty much whatever equipment you need to build as complex a creation as you desire. If you’ve never attempted to build a robot before, one of the best ways to start out is by buying a robotic kit. 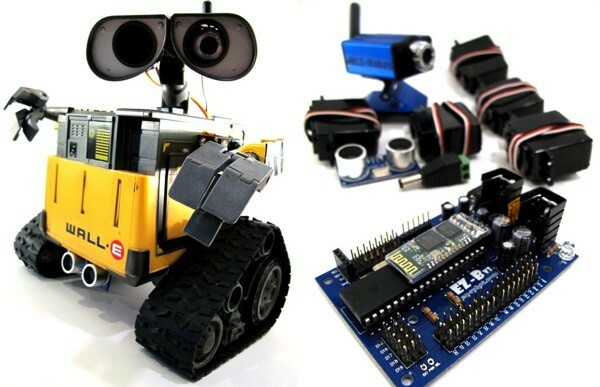 Robotic kits vary greatly in their complexity – some are suitable for everyone, some only for experts – so if you’re new to the world of robotics it’s best to start out with a relatively simple kit at first so that you can get a grasp of the basics. Fortunately, there’s a huge range of simple mini and modular robotic kits to choose from, so you’ll find it easy to find a kit that meets your skill level. One of the beauties of robot kits is that once you’ve mastered a few basic electronic principles and got to grips with your soldering iron, robot building has an incredibly steep learning curve, and so it won’t be long before you’re capable of building whatever your mind is capable of imagining. When it comes to robot building, the possibilities really are limitless – hardware, motors, arms, sensors, gearboxes and chassis, all are readily available from stockists. Perhaps best of all, particularly in these troubled financial times, is that robotics is a very low cost hobby to indulge in. It’s now possible to purchase a simple robotic kit for around ten pounds, and most components cost just a few pounds. Even if you ignore how much fun it is, solely in terms of value for money robotics is probably one of the best hobbies around. Building a robot kit is also incredibly rewarding, the satisfaction of having created something yourself is one of its main appeals – and it’s by no means a solitary activity either. In the same way that for older generations Airfix models were a pastime the whole family could get involved in, robot kits offer a great opportunity for fathers and sons, mothers and daughters to sit down together and have fun working together to create something fun and worthwhile. Say it quietly, but robot building is also an extremely educational hobby too – if you’re a parent it’s a great way to not only spend time with your kids, but also to fire their imaginations and get them learning some very useful skills and thought patterns.